There are some reasons to remove these crawling creatures naturally. Many reptiles, including lizards, carry salmonella and can make you sick if you become infected with the stomach bug. Also, many homeowners get a fright when they see small irritating lizards or geckos quickly darting across worktops, along walls, or over the floor. Because they are beneficial for the environment, you should not try to get rid of lizards by killing them. There are many non-lethal ways to repel lizards from your home and make your home less inviting for the four-legged reptiles. For example, specially designed lizard traps or natural repellent sprays will help to get rid of these scaly creatures. In this article, you will learn how to get rid of lizards without harming them. You will also find out some great ways to prevent lizards becoming a nuisance in your home. Before looking for natural ways to get rid of lizards from your home, have you thought about the benefit they serve? The reason that most lizards enter homes is to look for food. Because they like to feed on insects, they do a great job in reducing the number of insects flying around or crawling through your home. The International Journal of Biodiversity Science, Ecosystem Services & Management reported that reptiles and lizards also play an important role in seed dispersal. The study found that in many countries, lizards help to pollinate plants. As well as eating bugs and insects, lizards, geckos, and iguanas feed on fruits and these seeds are dispersed in the reptiles’ feces. So, considering the benefit that lizards have in many ecosystems, getting rid of them by killing them isn’t the best action. Even though lizards are beneficial to the environment, there are a few reasons to rid your home of lizards naturally. One good reason to get rid of unwanted lizards from your home is that they carry disease. If fact, if you have a pet iguana, gecko, bearded dragon, or anole as a pet, you should always wash your hands after handling them. Many people just don’t like seeing lizards dashing around their home. Although some people suffer from herpetophobia, which is defined as a “morbid fear of reptiles,” you don’t need a phobia to find lizards disturbing. For some people, a negative experience in childhood with a lizard may have caused the fear. Others just don’t like the way these scaly creatures suddenly dart away or that they can stay motionless for a long time staring at you. Some people are freaked out by their tails that swish from side to side. So, for many people who don’t want them as a pet, getting rid of lizards from the home naturally is the only option. However, these large, slow moving lizards generally only bite when they are handled. Even though lizards are good for the environment, not every homeowner wants to have lizards scurrying around their home. This is especially true if many lizards or geckos have chosen to inhabit your home. Here are some of the best ways to get rid of lizards naturally without injuring or killing them. To make sure that lizards aren’t attracted to your home, you must make sure that your home isn’t a food store for lizards. If you have a problem with lizards in your house, make sure and don’t leave out any food overnight. Food should either be covered or placed in the refrigerator. Also, make sure that your trash can is tightly closed so that lizards can’t get in there. You may need to make sure that you don’t have any flying pests or other insects in your home. Of course, lizards may help to get rid of mosquitoes or reduce the number of flying ants but you probably don’t want the lizard in your home. So take steps to exterminate all kinds of spiders and repel ants from your home naturally. There are also many natural ways to get rid of cockroaches naturally. For example, diatomaceous earth will quickly eliminate all kinds of roaches and destroy other bugs so that lizards aren’t attracted to your house. However, what should you do if you notice a lizard darting across the floor or you notice one clinging to a wall in your home? One of the best ways to get rid of a lizard from your yard or from a room in your home humanely is to make your own lizard trap. Lizard traps allow lizards to enter the trap and prevent them from escaping. Then, all you have to do is take the trap and release the lizard back to the wild. Take an empty container like an empty shoe box or large plastic tub. Stretch some plastic wrap or Saran Wrap over the top and make sure it is secured with tape. Cut a small hole or 6-cm long slit in the middle of the plastic wrap to allow the lizard to get in. In the container, place some bait like sweet fruit to attract and catch the lizard without harming it. The fruit may also attract small flies which will act as live bait for lizards. You can also buy some live bugs that lizards feed on from your local pet store. Place the box in a place where you have seen the lizard in your home. Check every day for a trapped lizard. When the lizard enters the trap, it usually won’t be able to escape out. You can then take the lizard away from your home and set it free. You can also place one or 2 traps in your yard or porch to get rid of lizards outside your home. Another way to deal with a lizard in your home is to make your own homemade spray. Many essential oils have repelling action against various reptiles and may help to keep your home lizard-free. Fill a spray bottle with 3 fl oz. (100ml) water and add 3 drops cinnamon oil and 3 drops clove oil. If you see a lizard, spray directly on the scurrying reptile and try to direct it in the direction of an open window or door. You can deal with a lizard problem by using a glue board to trap the annoying pest. Using glue boards to trap a lizard has the advantage because they can be placed in small places where it’s not convenient to place a trap. For example, glue boards can be placed under furniture, in cupboards under sinks, in cars, and any other place where lizards could hide. If you have a lizard that you can’t trap or get rid of with repellent sprays, then a glue board may be the best solution to your lizard problem. Glue boards can be purchased from online stores. Because it’s very difficult to get the lizards off the glue without injuring them, use it as a last resort or if you have poisonous lizards in your area. Sometimes, the best way to quickly get rid of a gecko or lizard from your home is to chase it out. However, before you start chasing the lizard away, you should try to remove hiding places from your room. This means moving furniture away from walls to prevent it darting behind the furniture to hide. You also need to block off exits into other rooms in your home. Completely block any gaps under doors that can be a convenient exit to the rest of your home. Open a door or window to your yard. Coax the lizard in the direction of the open window. You could also use a large piece of cardboard to help the lizard find its way out and not scurry around your room. You could also try some other natural methods to get rid of lizards without harming them. Although there is no scientific evidence that these natural lizard repellents work, there is anecdotal evidence that some people have had success in using them. Crushing up eggshells and putting them around your windows and doors to keep out scaly reptiles. Place garlic cloves at the doors to your home to protect your house from lizards. The sulfur smell of garlic around openings to your home could repel lizards. Similarly, onions could have a similar effect to garlic and act as a natural lizard repellent. Make a black pepper repellent spray and spray in hard to reach areas of your kitchen to stop lizards being attracted to your kitchen area. 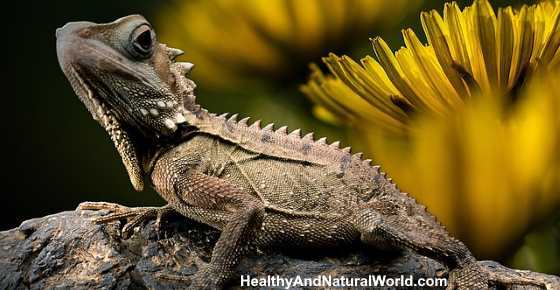 There are some commercially available natural lizard repellents that can help to make your home a critter-free place. Because they contain natural ingredients, they can be used safely around the house as they won’t harm pets (although, always read the manufacturer’s instructions). Lizard Blocker emits a smell that is offensive to lizards and can help to protect your home from lizards coming in. Lizard Blocker contains a combination of cedar oil, cinnamon oil, and clove oil as well as sulfur to repel lizards. You can apply it to areas around houses, garages, porches, flower beds, and gardens. For more information about Lizard Blocker see this source. Another natural lizard repellent to keep these fast-running reptiles from your home is Pest Rid. This comes as a spray formula and is marketed to keep all kinds of reptiles out of your home. The spray is natural and organic and should deter lizards, geckos, and other creatures from setting up home in your house. For more information about Pest Rid see this source. Lizard Defense is safe to use around the home to keep lizards out without harming children or pets. The natural ingredients used in Lizard Defense irritate lizards and geckos and force them to go away. The natural solution can be sprayed around your doors and windows, in gardens, garages, and porches to help prevent lizards in your home and outside. For more information see this source. Lizards usually come into your home in search of food. One of the ways to prevent lizards becoming a pest in your home is to stop them coming in in the first place. The best way to do this is to make sure you seal up any cracks on the outside of your home. Also, don’t have standing water near your home. These areas could become a breeding ground for lizards and before you know it, you may have a large population of lizards in or near your home. Therefore, keep buckets and other containers upside down to prevent rain water gathering in them. Do keep your house clean and free of clutter. Do keep mesh screens over windows or doors to prevent lizards coming in. Do use natural insecticides in your home to keep bugs and pests that lizards feed on away. Do have your furniture a few inches from the wall to stop lizards hiding behind it. Don’t leave foodstuffs out overnight. Don’t keep your home too warm as it may attract lizards when the weather becomes cooler. Don’t leave doors open for a long time if you have lizards in your area. PHYS. Importance of insect-eating animals to ecosystem health. Emerg Infect Dis. 2005 Mar; 11(3): 398–403. PetMD. What do lizards eat?